I was told over and over again it’s dangerous to go between his existing hair because of shock loss. Did you tell the patient shock loss is possible? Are some of the before pictures taken with his hair wet? There is always a risk of shock loss when placing within existing hair and placing within longer hair is more time consuming to ensure the correct angle and incision is made in relation to the existing growth. This patient, like all are told of the possibility of shock loss and the pros and the cons to shaving the recipient area; he in fact did suffer a little but recovered naturally. 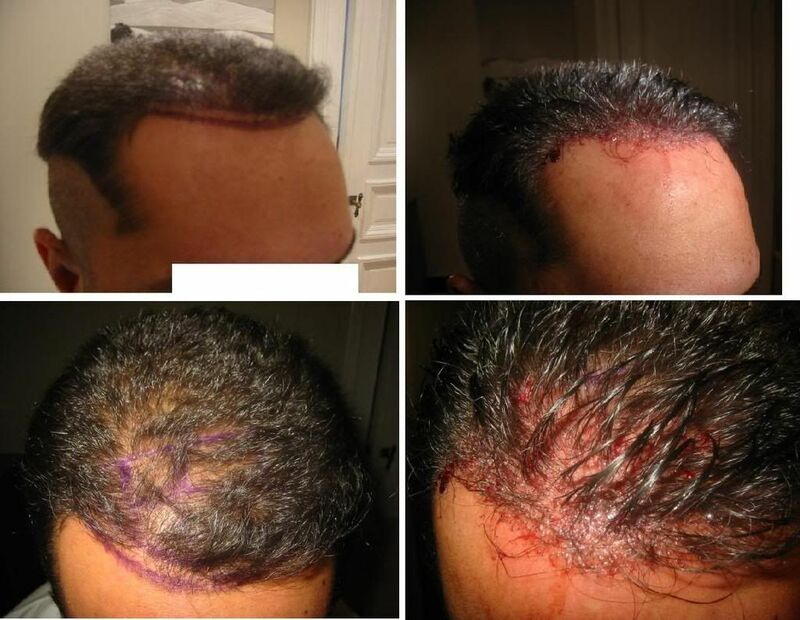 The pre op pictures are dry hair; the ones on the left of the first collage; the pictures on the right post op are wet; a saline solution sprayed onto the recipient to keep it clean and easier to work whilst placing. IMO, the work looks top notch. 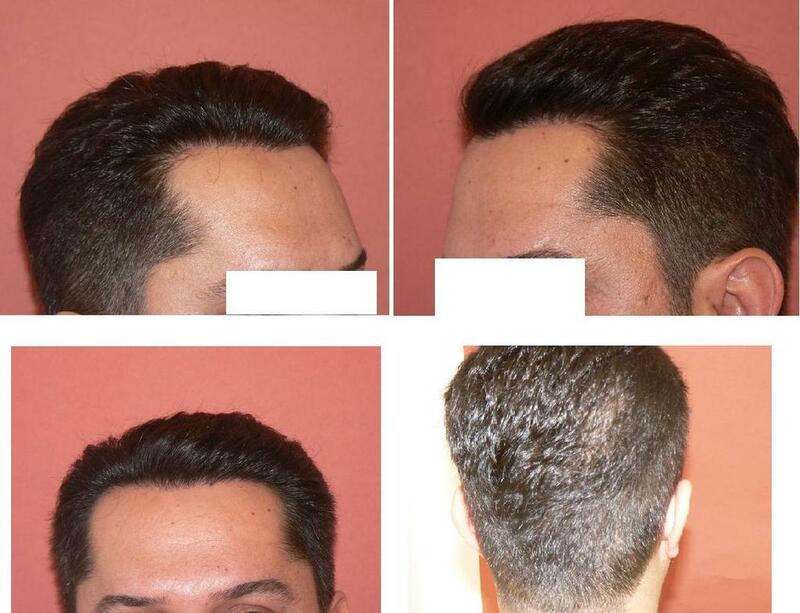 I notice that hairlines typically look better when the patients have very little hairloss to start with. I guess it is because the edge of the hairline can afford to be dense packed (even though if the patient is still young, chances are unless HM etc. comes to save the day, the work will turn into an HT island in 15 years). I think this incident with some good work and some bad work shown by the same doctor demonstrates that HT is not nearly as consistent a procedure as many people believe. Further evidence of this comes from going to the top HT docs’ sites and looking over their entire advertised patient line. Even the best doctors display some work that doesn’t look all that great. One has to wonder what the patients’ heads look like that don’t turn out good enough to be put on the website! In order to have any confidence at all to undergo the knife, patients need to seek out the surgeons who have the very best reputations, and even then there is really no guarantee you will turn out looking like the few patients that obtain the best results. JB, you hit it on the nail. It’s always a mixed bag, some good work, some bad work. Consistency is the key and there is no guarantee even with the doctors who have the best reputation. I have been coming to this forum long enough, even the so called top dogs have a few unhappy patients popping up here and there. That’s reality. » save the day, the work will turn into an HT island in 15 years). » top HT docs’ sites and looking over their entire advertised patient line. » Even the best doctors display some work that doesn’t look all that great. » will turn out looking like the few patients that obtain the best results. Yes, I totally agree. I often wonder what is the rate of success even for the best HT docs. It’s frightening to think that HT docs have been posting only the very best results in here. I hope this is not the case. » » save the day, the work will turn into an HT island in 15 years). » only the very best results in here. I hope this is not the case. What do you mean you hope that’s not the case? Use your brain. Of course they are only posting the best results in here. You think these doctors will upload pictures to show everyone how they mess up people’s head? » » only the very best results in here. I hope this is not the case. » will upload pictures to show everyone how they mess up people’s head? You took that too literally, Piperz was being sarcastic. » » » only the very best results in here. I hope this is not the case. » » will upload pictures to show everyone how they mess up people’s head? » You took that too literally, Piperz was being sarcastic. » » » » only the very best results in here. I hope this is not the case. » » » will upload pictures to show everyone how they mess up people’s head? » » You took that too literally, Piperz was being sarcastic. » Never again you sound pretty pissed off… did you have a bad experience? That looks extremely thick, nice work.